joby_toss wrote: Not working on my win 10 (GUI unresponsive). 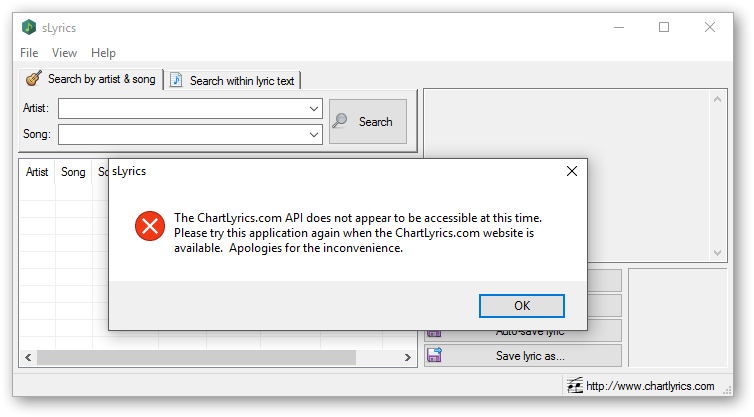 Unfortunately, at this time, it appears that the ChartLyrics website is down. It was up a few days ago so, hopefully, it comes back up in a few days and you can actually use this application. The ChartLyrics website went unresponsive a couple of days ago. I'm hoping it comes back up soon so the app can be useful. Also, there should have been a check when you first launched the application that mentioned this. Did that not work? No, nothing appeared on first app launch. Just the GUI, directly unresponsive (an empty Data sub-folder was created, though). joby_toss wrote: No, nothing appeared on first app launch. Just the GUI, directly unresponsive (an empty Data sub-folder was created, though). I've uploaded v1.0.2 with better startup checking for Windows 10. The ChartLyrics site still isn't up at the time of this post but at least sLyrics shouldn't go unresponsive now. I'm pretty frustrated that the ChartLyrics website went unreachable after developing this app. The site has been flakey in the past, but not to this extent. If anybody knows of another free lyrics site with a free API, feel free to let me know. joby_toss wrote: Thank you for everything you do for us! Yes, no problem now, I get the check and the settings file and the window is resizable, thank's! Quickly generate lists of all addresses from a list of subnets. Quickly generate lists of only pingable addresses from a list of subnets (not available on Windows 8/10). DNS scan mode to quickly retrieve hostnames from IP addresses. Fun icon themes in the list to show good, bad, and TTL expired pings. Configurable list — colours, fonts, etc. Supported OS: Windows 7/8/10. Probably works, but not tested, on Windows XP/Vista. 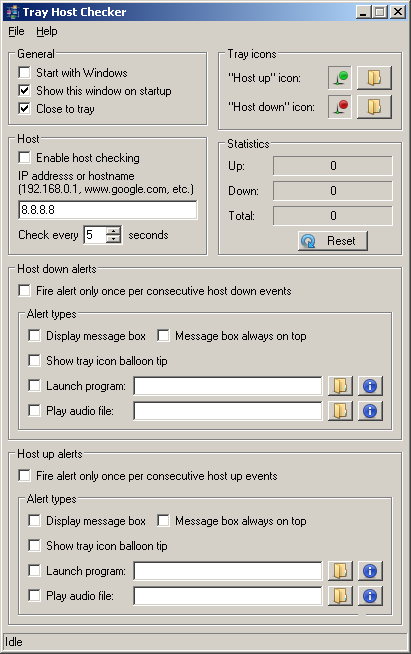 Tiny portable application which periodically pings a configured hostname or IP address and displays a tray icon to show success or failure. What a great idea. I've seen at least a dozen different website ping tools and nobody's thought of this very important capability: that when some sites go down, letting you know in a way that isn't intrusive or annoying is a big help. Still, I can imagine some situations where levels of notice might be helpful e.g. playing an audio file, launching a program, a tray popup, and/or prompting the user. Skwire's programs have been a big hit here (I use Splat daily) so I feel sure we'll get this added soon. webfork wrote: I can imagine some situations where levels of notice might be helpful e.g. playing an audio file, launching a program, a tray popup, and/or prompting the user. Please check out the latest version (v1.0.3) at http://skwire.dcmembers.com/fp/?page=tray-host-checker . I hope this is what you had in mind. skwire wrote: Please check out the latest version (v1.0.3) at http://skwire.dcmembers.com/fp/?page=tray-host-checker . I hope this is what you had in mind. Oh hell yeah. Let me test that out and get back to you. Thanks! Finally go to test -- this is excellent. I can see advantages for web developers, system and network admins, and people who just need confirmation their network is online. I have some spotty wireless for example and I'd much rather have this program tell me than wonder why I suddenly have a bunch of 404 msgs. Great program, thanks for making this available for free. You might want to set up a notification option that only notifies if something is down e.g. no prompt unless something's wrong. On the other hand I can see some folks wanting something in line with a heartbeat monitor in a hospital. It looks like any settings changes require a restart. I set notifications (in my test I used balloon tips) to check the process for 5 seconds apart. Then, if you set it to 60 seconds and the program still pops up every 5 seconds. You can fix this by restarting, but thought I'd point that out. Is there a log file of some type so you can see exactly when a host isn't reachable? I ask because I used to have a web hosting service that would go offline from time to time (dreamhost) and I wanted to be able to point to specific dates and times when that happened. Where can I find v1.0.3? I just came from Skwire Tray Host Checker site and the only version I saw available was v1.0.2.1 Released 07.03.2017. Happy.Camper2 wrote: Where can I find v1.0.3? Looks like I forgot to bump the version number when I compiled it. Try now, please. Skwire Empire wrote: MPCPLed is a new application written to fill the request made here. MPCPL files are playlist files created by the very popular Media Player Classic application. Unfortunately, re-ordering items with MPC’s built-in playlist editor is limited to dragging and dropping only one line at a time. Also, for keyboard ninjas, there are no hotkeys to shift items around. Needless to say, for long playlists, re-ordering items can get tedious. MPCPLed aims to make things easier by allowing dragging and dropping of multiple items and hotkeys for all actions. If you have such a need, please give MPCPLed a try.